BIRMINGHAM, Ala.— The Center for Biological Diversity on Saturday will host a celebration for a new 15-by-30-foot mural in the East Lake neighborhood in Birmingham, the fourth in a multi-city national endangered species mural project highlighting threatened wildlife. The project aims to use art in public spaces to increase awareness of regional biodiversity. Watercress darter photo courtesy USFWS. This photo is available for media use. The Birmingham mural will feature the watercress darter, a small, brilliantly colored endangered fish that is only found in the Birmingham metropolitan area. The mural is being painted this week on the wall of the soon-to-be-opened Lake Cottage Books. What: The public reception and unveiling will include music by the Oxy Morons, face-painting by Starshine Faces and crafts led by artists from the University of Montevallo art department. When: Saturday, Nov. 21, 2 p.m. to 4 p.m.
Media Availability: The mural is being painted this week by artist Roger Peet and the members of the Magic City Mural Collective, who will be available for media interviews at the site from 9 a.m. to 5 p.m. this week as they paint. The artists and scientist Tierra Curry will be available for interviews on Saturday. 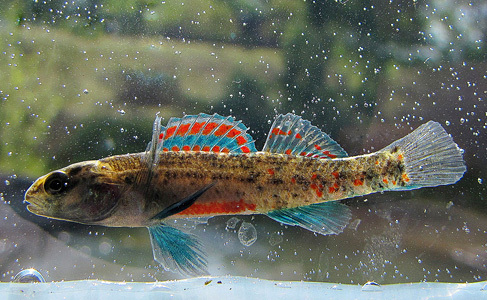 Protected under the Endangered Species Act in 1970, the watercress darter is now known to occur in only five limestone springs in the Birmingham metropolitan area. Urban development and water pollution continue to threaten the fish, and many organizations are working to protect it. The Center for Biological Diversity’s endangered species mural project is spearheaded by Portland, Ore., artist Roger Peet, who is teaming up with local artists to bring endangered wildlife to public spaces around the country. The project aims to promote a deep affinity for the natural world and the wild creatures that help define it, and features species that are unique to their regions. Birmingham was selected as the site of darter mural because Alabama is a world hotspot for freshwater animal diversity, and the Center is working to protect hundreds of Alabama species from extinction. Already installed murals include the mountain caribou in Sandpoint, Idaho; the Arctic grayling in Butte, Mont. ; and the monarch butterfly in Minneapolis, Minn. Additional murals are planned of the Ozark hellbender in St. Louis, Mo. ; the white fringeless orchid in Berea, Ky., and the pink mucket mussel in Knoxville, Tenn.